Ptolemaic Kingdom - Ptolemy II, 285-246 BC, and Arsinoe II. Mnaieion or octodrachm, ca. 273-272 BC, Alexandria. Obv. ΑΔΕΛΦΩΝ. Conjoined busts facing right of Ptolemy II, diademed and draped, and Arsinoe II, diademed and veiled, Gallic shield behind. Rev. ΘΕΩΝ. 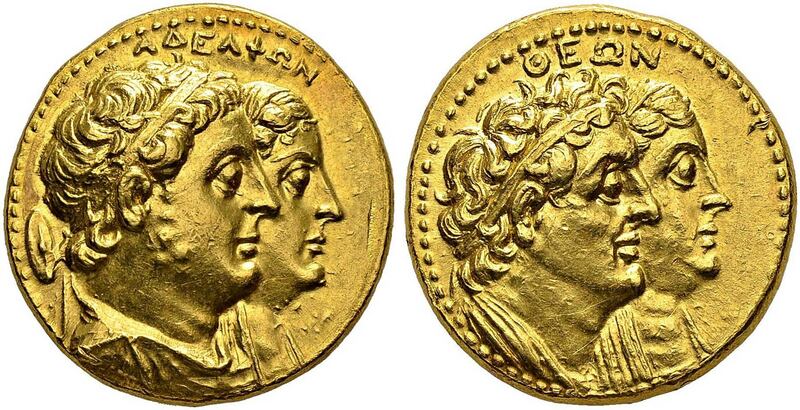 Conjoined busts facing right of Ptolemy I, diademed and draped, and Berenice I, diademed and veiled. Svoronos 603. Gold. 27.80 g.
Ex. NGSA auction 3, 29-30 november 2004, lot 44.